Happy Friday everyone! I am so glad the weekend is here. I was able to take advantage of summer hours today and spent the afternoon at my pool catching up on my reading and enjoying the HOT HOT HOT weather! 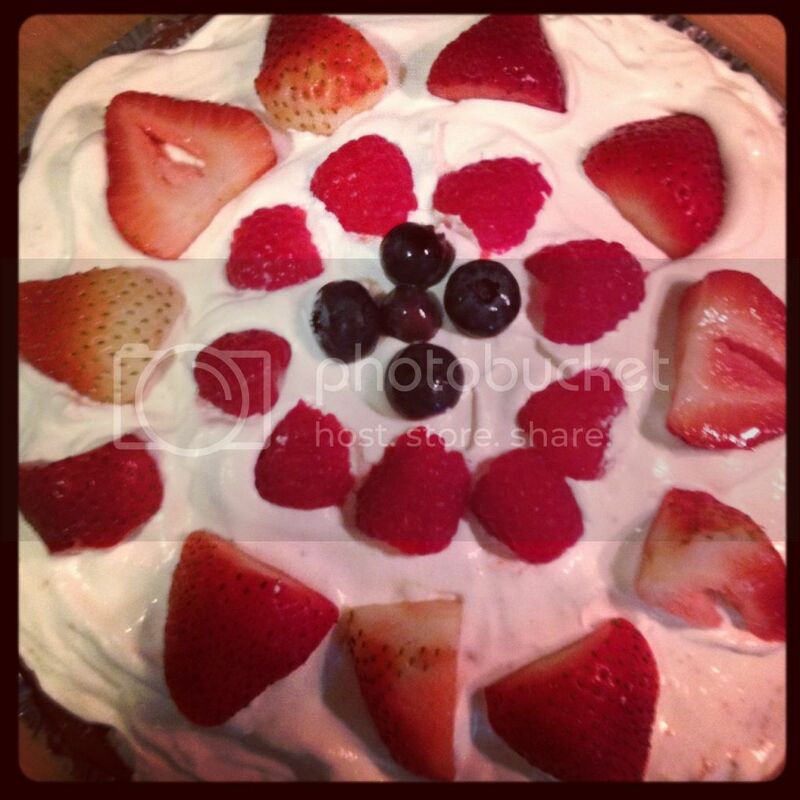 I decided to forgo my Friday Favorites post to share with you a fun dessert from our 4th of July cookout. I asked my Mom if there was a fun recipe of her's that I could share on my recipe blog, and we decided that we should make her White Chocolate Peanut Butter Pie for our cookout and then I could share our fun dessert with everyone. We decorated our pie with fresh berries to make it festive and fit with our holiday theme. My mom took the basis for her recipe from a few peanut butter pie recipes she found online. She then put her spin on things and used White Chocolate pudding. It's a chilled pudding pie, so it is very chill and refreshing for a hot summer day, and the white chocolate/peanut butter combo satisfies everyone's sweet tooth! It's always a big hit with our family and it's a perfect ending to a perfect day. Mix pudding and milk as directed on package. We mixed our's up in the blender. Then mix the confectioners' sugar and peanut butter together until crumbly. Place 1/2 of peanut butter crumbs on the bottom of the pie shell. Pour the mixed pudding over the crumbs. Then top with the remaining peanut butter crumbs. Cover second layer of crumbs with Cool Whip. You can save some of the peanut butter crumbs to put on the top as a topping, or you can top with fresh fruit like we did in the picture above. It should be 1 3/4 c. of milk instead of 3/4. Also, it is good to chill the pudding layer before topping with cool whip. Makes it easier to spread. Had a great holiday with you.